The Like button lets visitors share your website content with their Facebook friends. When the user clicks a Like button on your site, a story appears in the user’s friends’ News Feeds with a link back to your website. This plug-in is a must if you publish regular content on your website. Visit Facebook’s Plug-in Page and click the Like Button link. URL to Like: Enter the exact URL you want visitors to like. Leaving this blank will default to the URL of the page where the Like button is located. Send Button (XFBML Only): Select this check box to add the Send button features to the XFBML code. Layout Style: Choose from three different options: Standard, Button Count, or Box Count. You can view each in the preview to the right. 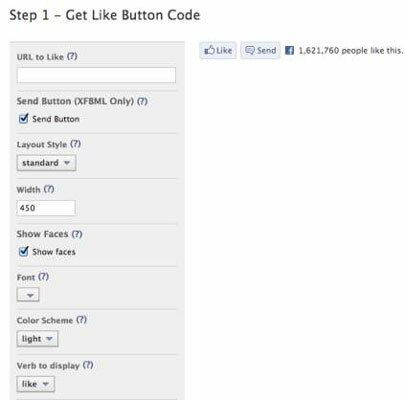 Width: Enter the desired width of the Like button in pixels. Show Faces: Selecting this check box sets the Like button to display the faces of users who have clicked the Like button. Font: Select any font from the drop-down menu. Color Scheme: Choose either Light or Dark. Verb to Display: Choose either Like or Recommend. If you have chosen the capability to measure how people are using this plug-in, select your app to the right of the This script uses the app ID of your app text. Copy the code and paste it into your website at the location you want the plug-in to appear. If you are not familiar with how your website works, please get a professional to help you.